In extending its bookable flight schedule from January 6 until March 8, 2016, Southwest Airlines is launching four new year-round routes on January 6. 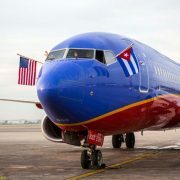 The aircraft, emblazoned with an artist’s rendition of the Missouri state flag, was unveiled at a ceremony on April 15 at the Kansas City International Airport location of aircraft-maintenance company Aviation Technical Services, with which Southwest has partnered for more than 35 years. Southwest Airlines is more than doubling the number of flights it operates from Washington Reagan National Airport this summer, launching seven new routes and additional connecting itineraries. At Grand Rapids, Southwest will offer double the number of flights AirTran Airways is operating. From August 11, Southwest will offer six daily non-stop flights, compared with three daily non-stop flights operated until then by AirTran. Southwest Airlines is launching twice-daily service between Washington Reagan National Airport and Lambert-St. Louis International Airport on September 30. On July 9 Southwest Airlines revealed it had bought four slots at Washington Reagan National Airport from another airline, the previous week. Southwest will use the slots to provide two daily round-trips between Washington Reagan National and Lambert-St. Louis International Airport. Lambert-St. Louis International Airport has honored Black History Month with the re-dedication of its ‘Black Americans in Flight’ mural, which highlights the contributions of African Americans in aviation through the Space Age. Vision Airlines’ newly published winter flight schedule and changes to its fall flight schedule will see the low-cost carrier dropping service to five cities, but at the same time it will add several new routes to Florida destinations. Some of the route changes will take place as early as August 19. Southwest Airlines and new subsidiary AirTran Airways are launching additional services from Milwaukee in the first week of September. On June 1, Vision Airlines will begin offering scheduled services to Northwest Florida Regional from Fort Lauderdale; Lafayette in Lousiana; Las Vegas (on a one-stop basis via Baton Rouge, Louisiana); Greater Memphis, through Tunica Municipal Airport in Mississippi; and St. Louis. Southwest Airlines will begin service to Newark Liberty International Airport with eight daily nonstop flights, six to Chicago Midway and two to St. Louis on Sunday, March 27, 2011. Alaska Airlines is launching daily service between Seattle and St. Louis on September 27. Regional airline Cape Air is continuing to expand its American Airlines-affiliated route network in the U.S. Midwest by launching three-times daily service between Kirksville Municipal Airport, Missouri and Lambert-St. Louis International Airport in mid-September. AirTran Airways and SkyWest Airlines have formed a new marketing partnership under which SkyWest will operate five 50-seat Bombardier CRJ200 regional jets between Milwaukee’s General Mitchell International Airport and six destinations.